Place whole oranges in a large saucepan and cover with water. Bring to the boil and boil for 1 hour. Drain and then allow to cool. Preheat the oven to 160°C and grease a cake tin with butter or coconut oil. Cut oranges in half and place in to a food processor (skin pith, flesh and all). Blitz until smooth. Add the remaining cake ingredients and blitz again until smooth. Pour in to the prepared cake tin and bake for 40-50 minutes or until a skewer comes out clean. Allow cake to cool completely before removing from tin or it may break. 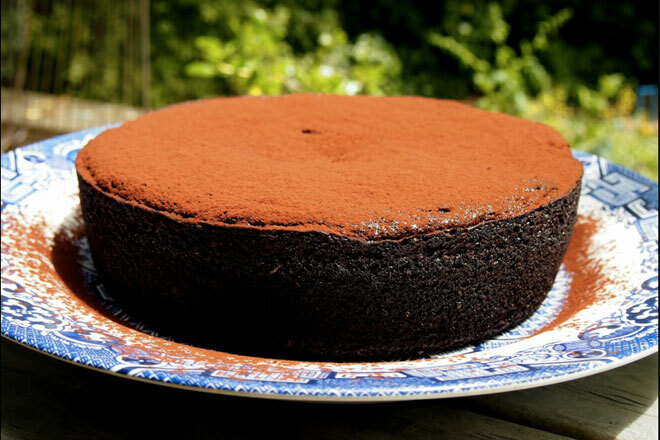 Once the cake has cooled down completely, dust with cocoa if desired.